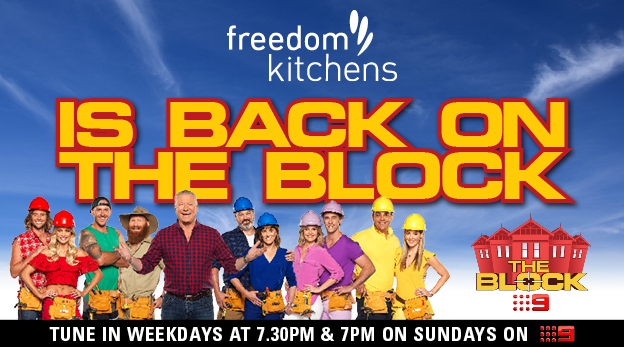 As the nation gears up for its favourite renovation program The Block, returning soon for its 13th season, Freedom Kitchens is proud to announce that it will also return to TV screens as the exclusive kitchen and laundry supplier. After the huge popularity of Kitchen Week on The Block in 2016, Freedom Kitchens promises to impress audiences once again by showcasing the latest in exciting design trends, inspiring millions of viewers for their own homes. With 12 successful seasons and a recent Silver Logie win for Best Reality Program, the highly anticipated new season of The Block will be located in Elsternwick, VIC. Channel Nine purchased the 2989-square-metre site as a vacant lot for $10.34 million, and five period style weatherboard houses have been relocated to the site for renovation. Over a 10-week period, viewers will share the highs and lows of the five couples competing on their renovation journey, and be inspired by their creativity. As experts on designing contemporary kitchens for the Australian lifestyle, Freedom Kitchens will guide the contestants through the creative design process to deliver innovative kitchens and laundries that are sure to impress, as well as add value to the five homes. “Freedom Kitchens has been part of The Block since the show began, and we’re proud to continue that partnership,” says Tracy Smedley, Director of Marketing and Retail at Freedom Kitchens. Freedom Kitchens will showcase exciting new products on The Block including the latest state of the art appliances from BSH, chosen as the exclusive supplier of home appliances for The Block kitchens and laundries. As in 2016, BSH will use the opportunity to enhance each kitchen and laundry space with stunning appliances from their premium brands Bosch and NEFF. Caesarstone® has also rejoined the show with Freedom Kitchens to showcase an exciting new colour range which has been airfreighted in especially for The Block. These houses will be the very first in Australia to feature stunning new designs for 2017– all destined to be a huge hit in benchtops. For more on The Block visit www.9now.com.au/the-block. Arrange a free in home kitchen design appointment with a professional kitchen designer today by filling in our design booking form or calling 1800 113 733.